Frames Of Mind ii: "Dialectic" has some very Lifeson/Lee-like guitar and bass interplay; reminds me of sections of the early 1980s Rush albums. In fact was it not for the drumming style - Joe's drumming has very little in common with Neil Peart's - and the lack of Geddy's screaming vocals, I would have taken this as some early Rush outtake I had not heard. Desolation is the shortest track on the album, weighing in at just under two minutes; indeed I had to play it several times over just to type this section of the review. As the title suggests, it is a sad, haunting track with minor synth chording creating a mist-drenched desolate landscape. Very simple, very melancholy and quite beautiful. ("Fotogrammi della mente" could be, more than simply the translation of the title of this album, also the main description of the music that you will find here. It's instrumental symphonic Progressive, played over a succession of situations, guitar riffs and atmospheres - frames - fairly disconnected from one another, but proceeding to form only one unit, maybe not in a physical way (the 9 tracks are disconnected and independent from one another), but from a logical and structural point of view. Guitarist Kulju shies away from overdrive and distortion remaining crisply "clean" most of the time so when he rocks out it leaps at you. Not overpowering but deftly "in your face". Foti stretches some on this track just as Kulju leaps in with a mighty Frippish explosion that lasts only seconds. Restraint, restraint, and more restraint. I dunno, this may seem picky but these guys could easily stretch more and pull out the stops more often. I felt teased into the finale where finally Kulju and Foti crank it, but again not for long enough to suit my fusion tastes. During the title tracks four and five I found myself propelled into the next two and I never noticed a break in that Electrum sound. Songs on this CD are more symphonic movements than individual, distinct entities. Inevitably, you have a "concept" album. The concept in fact is Electrum's signature flowing compositions. They embark on a journey, a quest. The feel is adventure soundtrack, interspersed with snippets of guitar in rhythmic tight grooves and/or rolling picking of open chords. Power chords appear in a Rushly attack with King Crimsonic odd-time plucking and distortion pushing the string-synth keys aside. Foti and Kulju are in sync much of the time until Kulju solos in his usual time-constrained agenda. Outro disco totalmente instrumental deste trio americano, que no encarte agradece ao Rush pela inspira��o. A sonoridade remete ao disco Signals (1982), principalmente a primeira faixa Ascension (10:56), inspirada pela not�cia de uma trag�dia ocorrida nos Everest, mas n�o sendo esta refer�ncia da m�sica. "Refere-se � escalar montanhas", diz Gino Foti (baixo e teclados). O objetivo do disco foi fundir diversas influ�ncias e g�neros em composi��es ecl�ticas, que mostrassem a parte subjetiva da realidade de cada m�sico. Por isso o disco � todo instrumental; onde os m�sicos puderam explorar todo o seu potencial. Ao contr�rio de outros grupos totalmente instrumentais - onde as bandas normalmente exploram em demasia solos dos instrumentos - a banda mant�m as m�sicas bastante concisas. Upon my first listen, my impressions are that it is great! It will take several listens for me to expound more because you guys have definately put alot of time into the compositions. It reminds me alot of what I tried to do in my band (but, not as well as you have done) I look forward to hearing more stuff of yours. Your put together a very professional looking cd - package. Truly a bargain for $8! Det h�r �r ett tremanna band som kom till efter en annons som Electrums gitarrist postade till National Midnight Star - Rush on-line digest/mailing lista, d� han s�kte efter andra musiker. Du kan ocks� h�ra Rush influenserna i Electrums musik som kan klassificeras instrumental progressiv rock. Deras musik �r en kombination av en myriad av influenser och genrer som t.ex. klassisk musik, jazz, progressiv rock, jazzfusion, prog metal, neo-progressiv musik, pop, folkmusik och heavy metal. H�r finner man komplexa takt�ndringar och udda rytmer, ackord och melodier. Musiken �r strikt arrangerad och har en v�ldigt komponerad k�nsla, p.g.a. att lead och solo sektionerna �r h�llna till ett minimun. Basisten Gino Foti har spelat bas i 6 �r, han �r helt sj�lvl�rd, men det l�ter som om han spelat i hela sitt liv. Jag �r f�rstummad �ver gruppens musikaliska kunskaper. Varje l�t p� det h�r albumet �r helt fantastisk. Mina personliga favoritl�tar �r "Reverie" och "Portal to Arcanum". Den h�r skivan �r ett m�ste f�r alla som gillar verkligt progressiv musik. Tillsammans med P�r Lindh Projects CD "Mundus Incompertus" den b�sta skivan hittills 1998. CD:n kan k�pas direkt via Electrums Website: [www.electrum.org] f�r bara $8 - inkluderat frakt inom USA. Orderformul�ret inneh�ller �ven l�nkar till on-line distribut�rer f�r de som vill betala med kreditkort. This is a three-piece band that got together after an ad that Electrum's guitarist posted to the National Midnight Star - the Rush on-line digest/mailing list, looking for other musicians. 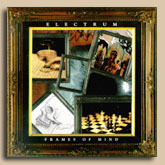 You can hear the Rush influences in Electrum's music that is Instrumental Progressive Rock. The bassist Gino Foti has been playing bass for 6 years, is entirely self taught, but it sounds like he's been playing for all his life. I am astounded by the groups musical skills. Every track on the album is totally amazing. My personal favourites are "Reverie" and "Portal to Arcanum". This is a must-buy for everyone who likes really Progressive Music. Beside Par Lindh Projects CD "Mundus Incompertus" the best album so far in 1998. Excellent first effort!! I have a few MINOR gripes, but it's probably the best set I've heard so far this year! You're what I liked most about Rush, without those silly vocals( sorry, Geddie, just kidding). The production quality is superb, nearly flawless, well mastered, even sounds good in headphones. I'm impressed! I looked in the local record stores and couldn't find your album it so I looked on the internet where I came across your web site. I ordered the CD from Planet off the internet and received it Saturday 8/29 and I've been listening to it and enjoying it ever since. Overall I really enjoy your music. Rush is obviously a big influence -- I hear a lot of Hemispheres to Signals era elements. I, like most people, wish that Rush would get back to their old style of their heyday and do what they do best, extended concept-album-type songs like what you're doing. Every time a new Rush album comes out, I hope that they'll get a little of the old spark back. If they came out with an album that sounds "Frames of Mind", I would piss myself happy.